Election season is fast approaching, which means local districts will once again have the opportunity to approach taxpayers to help fund school initiatives. Since Indiana passed property tax reform measures in 2008, school corporations have seen a smaller share of local tax money. 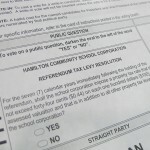 As a result, they now turn more often to referenda to fund construction and other projects. Just this past spring, 13 school districts placed 17 individual measures on their local ballots. This go-around, there are only seven school-related measures statewide. The smaller number could be attributed to research that finds referenda offered in May have a better chance of passing – since spring ballots don’t include big races such as this year’s mayoral contests or next November’s presidential election, researchers say May is prime time for pro-referenda voter turnout. Greater Clarke County Schools is asking for 39.27 cents per $100 of assessed valuation to finance what its calling the “2015 Multi-Facility Safety, Security, Technology, Construction and Restoration Project.” The district estimates the total project cost at around $109.2 million. Jerod Clapp of the News & Tribune reports the money will fund renovations for three district middle schools and one elementary, in addition to new buildings on existing sites for three other schools. The East Noble School Corporation will ask for 34.06 cents per $100 of assessed valuation to fund construction of a new middle school building. The district attempted this same measure last fall to no avail. Whitley County Consolidated Schools is looking for 59.47 cents per $100 of assessed valuation to help foot the bill for its own “2016 Safety, Security, Replacement and Restoration Project,” which includes construction of a new Columbia City High School as well as other campus improvements at schools throughout the district. The project’s cost estimate sits at around $85 million. Fremont Community Schools in Steuben County is asking for 19.63 cents per $100 of assessed valuation to help maintain current educational projects and class sizes, restore programs that have been cut and fund employee salaries. On their official website, the group Taxpayers for Fremont Schools says if the measure does not pass the district may have to entertain the possibility of merging with another school corporation nearby. The North Judson-San Pierre School Corporation will ask for 47.5 cents per $100 of assessed valuation to supplement general operating funds. Zionsville Community Schools will look for 24.44 cents per $100 of assessed valuation to help maintain programming that it says “reflects community standards.” As we’ve reported, Zionsville is one of the lowest funded school districts in the state, and changes to the state’s school funding formula during this year’s legislative session didn’t help their case much. Since November 2008, a little more than half of the 104 school-related referenda proposed in Indiana have passed. You can also check out our referenda scorecard to see how voters in Hoosier districts weighed in on those measures. Referendum results will available on StateImpactIndiana.org November 4. You can also follow results live November 3 on Twitter by following @StateImpactIN, @morellomedia and @ClaireMcInerny.